When you sign up for the Reading Kingdom, you receive a free 30 day trial unless you choose an immediate billing option. - 1st student is $19.99/month, or $199.99 per year (20% off) with a 30 day trial. If you pay at the time of signup (skip the trial) it is only $14.99/month or $149.99/year. - Each additional student is $9.99/month, or $99.99 per year (20% off) with a 30 day trial. If you pay at the time of signup for an additional student (skip the trial), it is only $7.49/month or $74.99/year. You may cancel any of your individual monthly subscriptions at any time. If you are using the 30 day trial and you cancel before the end of 30 days you will not be charged. Monthly subscriptions renew each month. Annual subscription payments are one-time and do not renew. Contact us for information on volume licensing discounts. We're passionate about promoting literacy and believe that every child has the right to learn to read. We don't want to turn anyone away. So, if you can't afford to pay full price for the program, you can apply for our scholarship subscription which enables your child to participate in the program at a reduced cost. Bear in mind that we're a privately run company and make our money by your subscriptions, so if you can afford to pay, please do so, because your support enables us to continue to develop products and promote literacy. 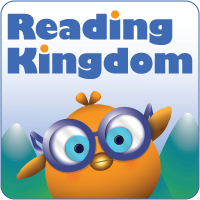 Before applying for a Reading Kingdom scholarship, please sign up for a 30 day trial. Then you must use the program with the child you are working with a minimum of 4 days per week for 3 weeks after which you can fill out the scholarship form located here. We will let you know if your scholarship has been approved before the 30 day trial is over. Scholarships are awarded at our discretion.